The CDC (Centers for Disease Control and Prevention) recommends we get a minimum of 150 minutes of physical activity each week. What’s a free, easy way to achieve that goal? Walking! The problem is that walking on U.S. public roads is proving to be increasingly risky and in many cases, downright deadly. All 50 states have improvements that could be made, but some states have an urgent safety crisis on their hands: rising pedestrian deaths. As documented by the NHTSA (National Highway Traffic Safety Administration), in 2014 a pedestrian was killed every two hours and injured every eight minutes in U.S. traffic crashes on average. Walking should add years to your life, not bring a sudden end to it. Whether you are a pedestrian or driver, make sure you have the right coverage. Shop around for three to four policies here. Louisiana offers beautiful waterways and entertainment during Mardi Gras. Just keep in mind that strolling by the alligators in the Bayou may be less risky than walking on their roadways. Over 14 percent of those who died in traffic accidents in Louisiana were pedestrians. With Louisiana only making up 1.05 percent of the U.S. population, it’s alarming that as many as 105 pedestrians were killed on public roads in this state. Seventy-four people who made the healthy choice to take a walk died in that one year alone. These tragic circumstances are the opposite of enchantment. More like horror. The fifth largest state by land area but only the 36th by population, New Mexico has 22 million acres of forest and farmland. But even with all that roadless land, “The Land of Enchantment” had pedestrian deaths totaling over 19 percent of the total traffic fatalities in 2014. Known as “The First State,” “The Diamond State,” and “A Small Wonder,” Delaware has many nicknames but too few safe places for its residents to walk. With 25 pedestrians killed, hopefully road improvements are made soon. Ranking 49th by land area and 45th by population, Delaware is a small state with a big problem. 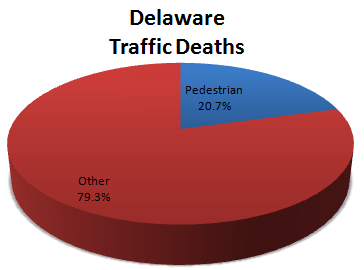 With over 20 percent of those killed in traffic accidents being on foot, Delaware is home to some of the deadliest roads for pedestrians in our nation. Moving southeast, we come to a state with different demographics but the same safety concerns. “The Sunshine State,” ranking only 26th by land area but fourth by population, has some of the best weather in the world, but sadly, its residents aren’t safe to walk outside. A shocking 588 pedestrians were killed on Florida roads, which was over 23 percent of the total traffic deaths that year. Orlando’s roller coasters don’t offer nearly as much risk as taking a stroll in this state. Back in the west, we find the U.S. state with the deadliest roads to walk on: Nevada. Almost a quarter of those killed in traffic accidents in 2014 were people not even in a vehicle! Even though it only makes up .87 percent of America’s population, Nevada still managed to have 70 pedestrians killed by moving vehicles in just one year. Hopefully “The Silver State” will realize the need to invest in safer sidewalks. With growing awareness of the negative effects of pollution and the positive results of walking, our nation should be built to encourage alternative modes of transportation. Rather than being encouraged, however, pedestrians are being killed. Why would people walk to their destination, when getting hit by a moving vehicle is, statistically, the likely outcome in their state? Americans are well aware of the benefits of walking. Now, if only being a pedestrian could be a safe choice rather than a deadly risk. Speaking of risks, don’t take risks with your car insurance! Use our FREE comparison tool to review three to four policies to make sure you have the right coverage!